If you could value would be grateful, contact name is Maria and I live in jersey, channel islands. Editor's reply: Thanks for writing to request a valuation. As I have not seen the condition, it's hard for me to judge. The record sale for this comic book is $525 for a graded 9.2 book. It's really not worth anything under very fine condition. You'll do well to get $20 for it in average (very good to fine) shape. 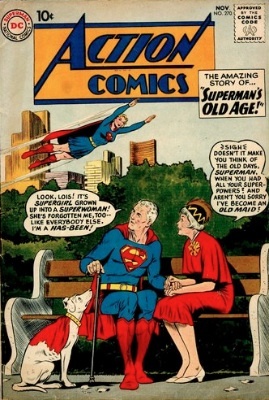 You can read more about Superman comic books here. Thanks again for your patience, I hope you send us more comics for appraisal soon.